· The principal activities of FFB's subsidiaries are designing, manufacturing, supply, servicing, trading and renting of cranes. · Four main cranes - Tower cranes, Offshore cranes, Crawler cranes and Wharf cranes. · EPS recorded CAGR of 25.32% from year 2010 to 2014. · From law of 72, 25.32% return may double our capital in 2.8 years. High growth rate of return is one of reason Favco's PE low as 6 currently. 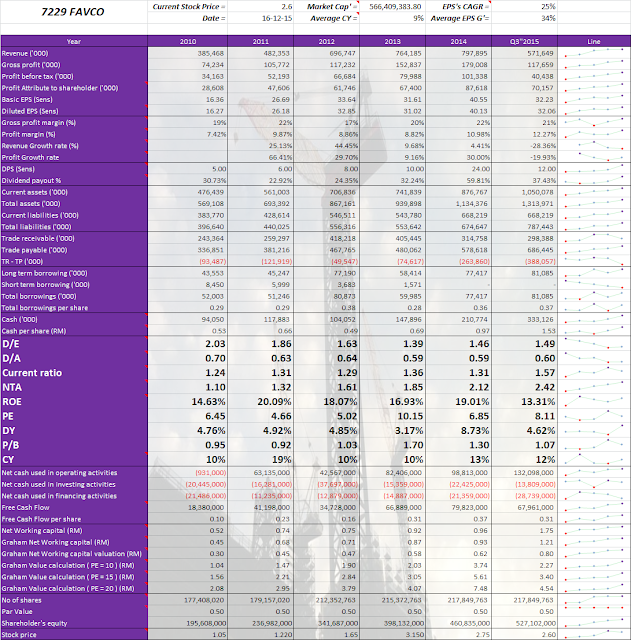 · Favco's total liabilities actually mainly build up by trade payable and this trade payable is going seriously by yearly. This may one of the weaknesses Favco. · High payable and net negative trade may show Favco is unable to pay off their creditor. · Favco's effort on clearing its short term borrowing can detect clearly from year 2010 to 2014. It is diminishing and going zero in last year. · ROE is striking through the years too; it is recorded 19% last year. It is pass my ROE target on criteria to choose firm. · Investment Master, Cold Eye always suggests his follower to deal the company's share during its PE is under 10 and Favco's PE is under 10 every year. · Free cash flow of Favco is attractive as it is growing every year, it is recorded CAGR of 44.36% within latest four years. · As current market trend is bottom tide of international oil price, it may affect Favco's business activity but I think it may a tiny effect to Favco's business is diversified by heavy lifting in construction area. · Favco also able bring us least 4% of return which derived from DY 4%. From view on EPS, Favco is categorized as growing stock. 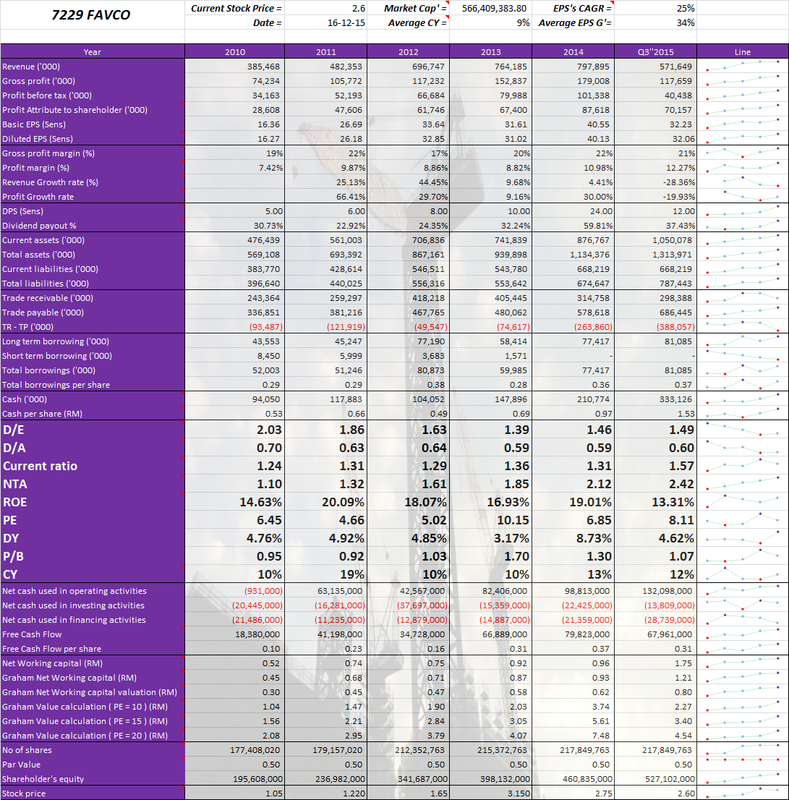 · Latest Q3''2015 report mention Favco has outstanding order book of RM 776 million as at 18/11/2015. · Order book mainly builds by global oil and gas, shipyard, construction and wind turbine industries. · Revenue of Favco divided into Inside Malaysia and Outside Malaysia (reports no mention detail revenue of outside malaysia), both segment of revenue is approximately balance. · Outside Malaysia include Singapore, United State, Australia, Denmark and China. China is the new market explored by Favco currently. · Listed public company Muhibbah Engineering (M) Bhd (5703) is holding 60% of shareholding. Favco is one of the subsidiaries of Muhibbah Engineering. 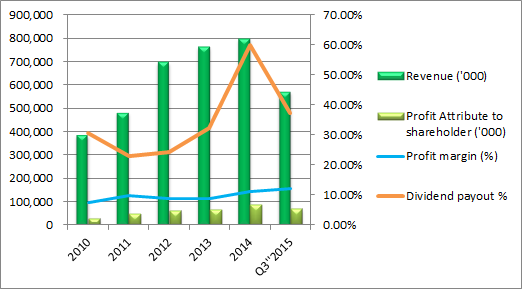 · Chart showing the data from year 2011 to 2014 and include the latest Q3''2015. · Revenue is hiking from 385 million to 798 million and there is uptrend. · Revenue and profit look forward to break new high again in annual report 2015. · Dividend payout exceeds 50% in year 2014 and achieves 8.73% DY last year. · Profit margin also maintained around 10%.